Devin Townsend does not do things by halves. Part creative genius, part raving loony (possibly) he may be, but it’s very hard not to be impressed by the dedication and inventiveness he brings to the rock scene. His four album concept under the Devin Townsend Project banner certainly made people sit up and take notice, with each album having a different style and line up to the last. Then came the mad idea to perform all 4 albums in their entirety over 4 nights in London. Not an easy task, but a rewarding one as evidenced by the mighty box set now available. It should be said that all we have been sent is the four DVD set, one for each concert. By all accounts the full package, which adds 5 compact discs as well, comes in a really lavish box set that will make you weep with joy at it’s sensuous beauty. Then again, we didn’t get that, so you’ll have to find out for yourself. Mind you, after sitting through the complete DVD set, I do want the full package, as this is something worth keeping and will not be getting anywhere near the ‘coaster’ pile. Bringing together as many personnel from the original recordings as possible (plus appearances from the wonderful Ziltoid), Townsend and his team have created not just a night to remember, but four nights to remember. The music is excellent, although my personal favourite is the more upbeat ‘Addicted’ album, and the camerawork and cutting is uniformly excellent, especially given that the venues are not that large. Townsend himself comes across very well indeed, happy to talk to the audience and interact. Special mention should go to Anneke Van Giersbergen, who provides additional vocals on ‘Addicted’ and does a terrific job indeed. 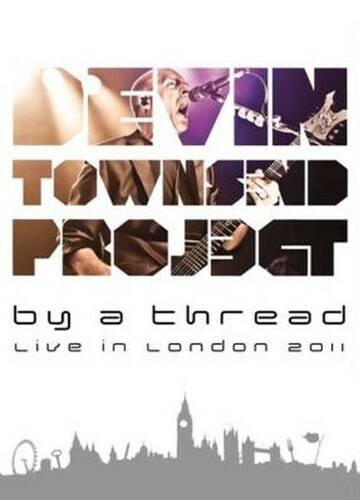 Perhaps not to everyone’s tastes musically (although most rockers should like plenty of it), ‘By A Thread’ is certainly a lasting testament to Devin Townsend’s music and to his talented cohorts. If you have the albums this is an absolute must, and if not I would still highly recommend it, as it’s a fascinating, entertaining musical journey.